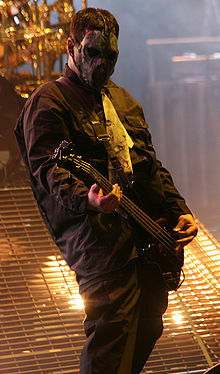 Paul Dedrick Gray (April 8, 1972 – May 24, 2010) was an American musician and bassist for Nu Metal band Slipknot. He was born in Los Angeles, California and moved to Slipknot's home town when he was just a baby. He was the only member of Slipknot who was not from Des Moines, Iowa. On May 24, 2010, The Des Moines Register said that Gray had been found dead in a hotel room in the TownePalace Suites hotel in Urbandale, Iowa. An autopsy performed on June 21, 2010 showed that Gray died of an accidental overdose of morphine and fentanyl. It also showed that he had signs of a "significant heart disease". His physician Daniel Baldi was charged with involuntary manslaughter in September 2011. Baldi was accused of continuing to write high-doses of prescription drugs for Gray even though it was known that Gray was a known drug addict. He was also charged with the deaths of seven others and pleaded not guilty when he faced charges. ↑ "Slipknot co-founder Paul Gray found dead at Urbandale hotel". Des Moines Register. Retrieved 2012-12-30. ↑ "Slipknot bassist died of morphine overdose". MSNBC. Retrieved 2012-12-30. ↑ "Slipknot bassist's doctor charged with involuntary manslaughter". The Guardian. Retrieved 2012-12-30. This page was last changed on 8 April 2016, at 02:44.